1Department of Soil and Environmental Sciences, Amir Muhammad Khan Campus Mardan, The University of Agriculture, Peshawar, Khyber Pakhtunkhwa, Pakistan; 2Department of Soil and Environmental Sciences, The University of Agriculture, Peshawar, Khyber Pakhtunkhwa, Pakistan; 3Research Officer, Agricultural Research System, Khyber Pakhtunkhwa, Pakistan; 4Department of Water Management, The University of Agriculture, Peshawar Khyber Pakhtunkhwa, Pakistan. 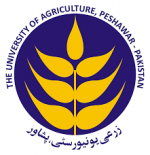 An experiment in pots was carried out at Amir Muhammad Khan Campus Mardan, The University of Agriculture to screen out bread wheat varieties in different soils at early growth stage. Five bread wheat varieties i.e Atta Habib, Barsat, Siren, Pirsabak-2004 and Pirsabak-2005 were cultivated under three soils having different salinity levels; i- Normal-non saline soil (EC=0.9 dS m-1), ii- moderately saline soil (EC=7.2 dS m-1) and iii- highly saline soil (EC=13.3 dS m-1). The experiment was arranged in completely randomized design (CRD) with two factors, repeated thrice. Wheat varieties were sown per pot randomly on 15th November, 2014 and grown for 3 weeks after emergence. Plants growth was observed for three weeks after emergence. Statistical analysis of the data showed that both soils and varieties significantly (p<0.05) affected per cent emergence and growth. Interactions between soils and varieties were significant (p <0.05) regarding emergence and plant heights. 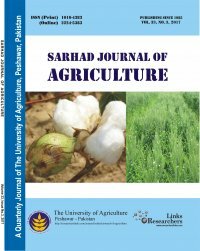 From the interactions it is clear that under normal soil conditions, emergence percentage of Pirsabak-2004 variety was maximum (100 %), under moderate soil salinity, emergence percentage of Siren variety was maximum (27 %), while under high salinity, emergence percentage of Atta Habib variety was maximum (30 %). 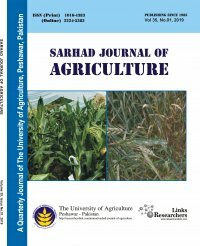 Under highly saline soil, the maximum plant growth i.e 1.03 cm, 1.80 cm and 3.77cm after 1st, 2nd and 3rd week of emergence were recorded by Atta Habib variety, respectively. Atta Habib variety also showed maximum plant growth of 9.93 cm in normal soil after 3rd week of emergence. In moderately and highly salt affected soils, maximum plant height of 3.3 cm and 3.7 cm respectively was produced in Atta Habib variety. Thus it was concluded that Atta Habib variety was more tolerant to salt affected conditions at early growth stage as its emergence percentage and plant height was significantly different from other four varieties.